The similarity between two of Northwood’s most popular patterns is fascinating. The Peacock on the Fence and Good Luck patterns are indeed kissin’ cousins. Made only in 8 1/2” bowls and 9” plates, these two patterns are much alike when it comes to color, shape, and exterior pattern. The Peacock on the Fence appears to have been made in a somewhat wider range of colors, but the similarity is still remarkable. Except for certain shapes and colors these patterns were made in great volume and were obviously Northwood’s “bread and butter” pieces. In spite of their abundance, these bowls and plates always command a good price. Their popularity is unique. It would be a surprise to see even a modest collection that didn’t have an example or two of these patterns. 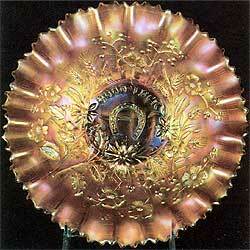 Only three shapes are known–plates, ruffled bowls (8 ruffle) and pie crust edge bowls. These three shapes are from the same mold and are simply shaped differently while still pliable. So while the choice of shape is limited, this is more than offset by the wide range of colors that were made. I have always found it a bit surprising that no ice cream bowl shape was used for either of the patterns. It is also interesting that they used three different exteriors on these pieces–ribbed, plain, and basketweave. It appears they used whatever bottom portion of the mold was available and alternated the two plunger portions of the mold that carries the interior pattern. We’ll mention this again when we talk about pastels. Well, let’s get into it and list the colors that are found on the various shapes. As you can appreciate some colors are very common while others were used sparingly and are extremely rare. 1. 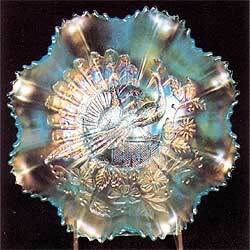 Ruffled Bowls (8 ruffle)–(This is the shape most often seen but still very rare in some colors.) Found in marigold, blue, purple/amethyst, green, aqua, opal (scarce, popular and expensive–Photo #1), ice blue (rare–Photo #11), smokey (rare), ice green (rare), white (rare), blue opal (rare), sorbini (this is iridized blue/white slag–one example known–very rare), aqua (rare), teal (rare), iridized custard (rare–two known), clambroth (rare), lime green opal (reported but not confirmed). Also found in non-carnival blue opal, white opal, and vaseline opal. 2. Pie Crust Edge Bowls (Somewhat more rare and desirable than the ruffled bowls). Found in marigold (Photo #9), blue (Photo #3), purple/amethyst, green, aqua opal (rare), ice blue (rare), ice green (rare), white (rare). 3. Plates found in marigold, blue, purple/amethyst, green (very scarce), ice green (Photo #5)–unlike most pastels in this pattern, these plates are the easiest of all to find. Still very popular, white (scarce), ice blue (very scarce, Photo #7). 1. 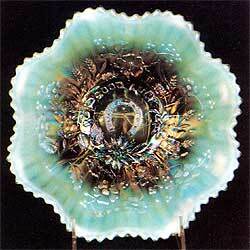 Ruffled Bowls (8 ruffle)–(This is the shape most often seen, but like the Peacock pattern, it is very rare in some colors). Found in marigold, blue, purple/amethyst, green, ice blue (Photo #12–very rare–5 or 6 known), ice green (very rare–only one confirmed), white (very rare–5 or 6 known), aqua opal (very scarce and very desirable, but more available than other pastels in this shape, perhaps 15 or 20 known, Photo #2). 2. 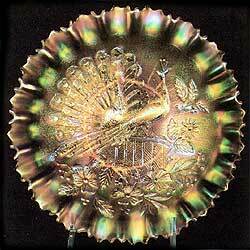 Pie Crust Edge Bowls (like the Peacock, this shape somewhat more rare and desirable than the ruffled bowls). Found in marigold (Photo#10), blue (Photo #4), purple/amethyst, green, and aqua opal (very rare–two or three known). No ice blue, ice green, or white have been confirmed in this shape to my knowledge. 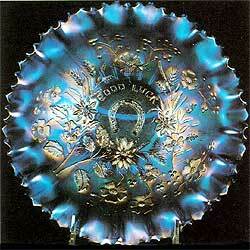 (Mention must be made of one rare Good Luck Variant pie crust edge marigold bowl. It sold in the Comer auction in November, 1982, for $375. This variant is a much plainer pattern with fewer background flowers. It was, no doubt, experimental. 3. Plates found in marigold, blue, green, purple/amethyst, white (very rare–5 or 6 known), ice blue (Photo #8–very rare–only one known), and ice green (Photo #6–very rare–only one known). Concerning the three variations of reverse patterns on these pieces, my research indicates the ribbed back was used most frequently. This is particularly true of the Peacock pieces. 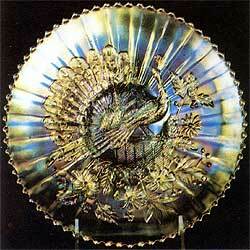 I find the Basketweave on a few white Peacock plates and on one ice green plate. 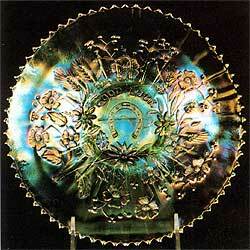 Green, white, and ice blue Peacock plates can be found with plain backs. I can also confirm one pie crust edge bowl in this pattern with a plain back. 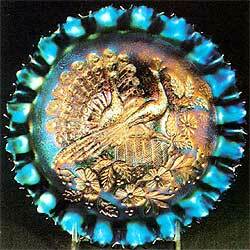 Except for the variations pointed out here, the remainder of the Peacock pieces carried the ribbed back. 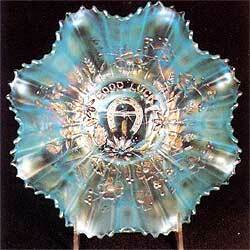 On the other hand, the Good Luck bowls and plates quite regularly carry the Basketweave as the reverse pattern. This is true of marigold, blue, purple/amethyst, and green bowls and plates. 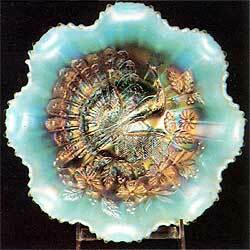 However, to my knowledge, all of the pastel bowls and plates have ribbed backs. Stippling is another interesting aspect of these two patterns. I find that it appears very inconsistently on a few marigold and dark bowls and plates. I estimate there are 6 or 8 non-stippled pieces to each one that is stippled. 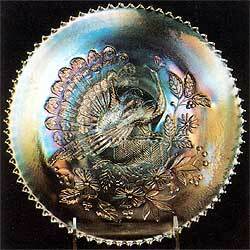 To my knowledge there are no pastel bowls or plates in either pattern that are stippled. I have, however, seen reference to an ice blue stippled Good Luck bowl that is supposed to have sold in the DeMoss auction, July 3, 1982. I am not familiar with this auction, but have learned that many of the pieces sold were mislabeled. Well, so much for the kissin’ cousins. I hope I haven’t bored you too much with all these details. If so, just look at the pictures. They’re nice.